Fresh from his victory over a human opponent, Vesselin Topolov, World Chess Champion Vladimir Kramnik, lost the sixth and decisive game against computer program Deep Fritz on Tuesday, ceding a hard-fought Man vs. Machine match 4-2. The Russian takes home $500,000, half of what he would have received if he had won against Deep Fritz, a commercially available chess program that runs on a powerful personal computer. Kramnik said he was "a bit disappointed" and expressed hope that a rematch could be arranged in a year or two. "With more time to prepare, I still have a chance." With a computer that calculates millions of positions every second, "there are always certain threats," Kramnik said. 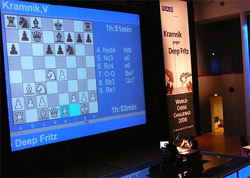 Former World Chess Champion Garry Kasparov, was the first to play a match against a computer several years ago, which ended in a draw. He would lose the re-match to "Deep Blue", and his game never seemed the same. Previously brushes with computers and world champions, also saw Anatoly Karpov nearly lose a simultaneous exhibition to one, when the computer missed a forced checkmate, and Bobby Fischer's demolition of M.I.T. 's weak "Greenblatt" program in 1978. "Fritz" has been available for some time now, and is considered one the leading database programs for computer chess. E. "Doc" Smith is a former Rhode Island Amateur Champion, and has won divisional titles in the U.S. Amateur Team Championships for Brown University as well as the Rhode Island Chess League Championships.